None of these wines are currently in the LCBO, not even a different year from what was tasted. 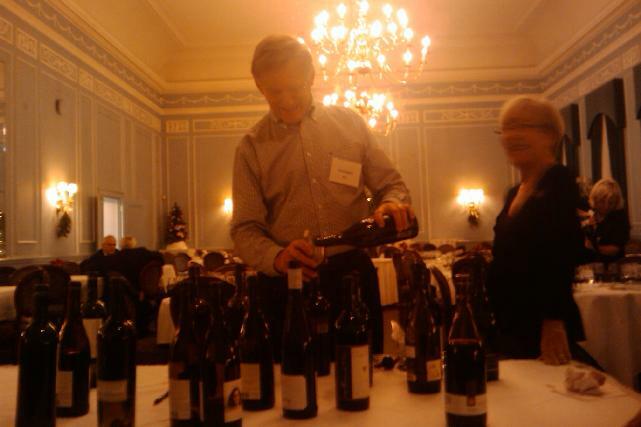 The event was run as a blind tasting to add some fun! 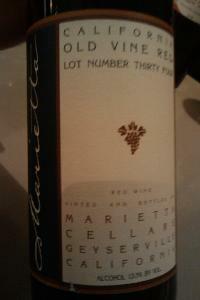 We started the evening with a cab from Marietta Cellars $20 or so. This is a very interesting wine in that there is no year on the bottle. They blend grapes from different years into the bottle to craft the wine. I am told this is called an “NV” or non-vintage wine. I have run into a few times but not all that common. The wine was dark in color with a dominant tobacco smell that persisted. On the mid pallet there were lots of dark dried fruits, cherries, prunes etc. On the finish the wine was light with a hint of dryness that built on the tongue. One would not confuse this with a Napa cab, very unique experience! For the rest of the tasting we first did Pinot Noirs and then onto cabs. Pinot’s can be quite interesting. 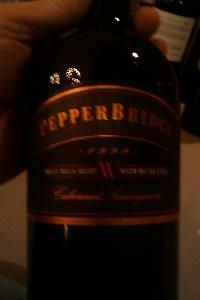 Bouquet’s of earthy notes, barnyard, and the like are not uncommon. Rustic tastes are also quite common. 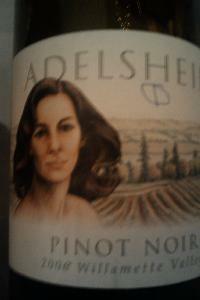 First up was a 2006/2005 Adelsheim Pinot Noir. It was quite surprising how different the 2005 and 2006 were. The 2006 was the typical light color while the 2005 was dark enough to be confused as a cab. The 2006 was $35 and the 2005 was $38. On the nose the 2006 was earthy and rustic. On the mid pallet there were lots of lovely subtle fruits. On the finish the wine was moderately complex with just a hint of tartness. This was my favorite of the Pinots. The 2005 had quite a barnyard smell on the nose. Not unpleasant, not atypical. On the mid pallet this too was a fruity wine with medium finish and a rustic taste. The wine had a funky finish to it that was not all that nice. It was also not as long as the 2006. This wine was my second least favorite of the pinots. Amazing what difference a year can make! 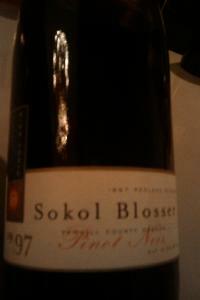 Next up are the 1997 and 1999 Sokol Pinot Noirs. The 1999 was an Old Vines. They 97 went for $35 and the 99 Old Vines went for $120. The 1997 had a very unpleasant bouqet which reminded me of a bathroom. Yuk. The wine tasted better than it smelled, but not a whole lot. This one earned the least favorite Pinot in my book. The wine was rustic on the mid pallet and really not a great finish. I suspect my taste buds could not get past the nasty smell. The 1999 displayed prominent wood on the nose. Quite smooth on the mid pallet but the fruit had all but dissipated (for my tastes). On the finish the wine had a slightly bitter tart taste that fought a bit with some of the mid pallet sweetness. I actually wondered in my mind if this one was past it’s prime. For the smoothness this was my second favorite of the Pinots. 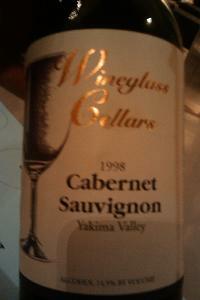 First up is the Wineglass cellars 1998 cab which retailed for $69.50. The wine was quite mild on the nose. On the mid pallet are some subtle cab flavors with cherries being dominant. On the finish this is a smooth easy drinking food friendly cab. This will not be mistaken for a boisterous Napa Cab. This is a well made, wine that has aged very well. This one netted my “best of the night cab”! 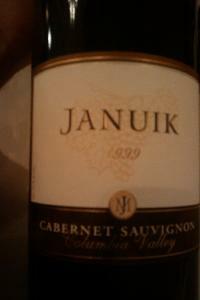 Next up was the Januik 1999 Cab which retailed for $64.95. The wine had quite an earthy note to it. If I had not been told, from the bouquet, this wine smelled a whole lot more like the Pinots we had tasted. Chris said “vegetal highlights”. Yup I could go with that. On the mid pallet the wine also had more of a rustic pinot like taste. Finish was mild. This was my second least favorite cab. It wasn’t nasty by any means, just not what I expect from a cab. On the nose I got some strong alcohol/petrol smells. No idea where this came from. Happily the wine tastes better than it smells! On the mid pallet this is a lovely smooth wine with a nice finish with tannins in control. This wine has aged well. This was my second favorite cab! 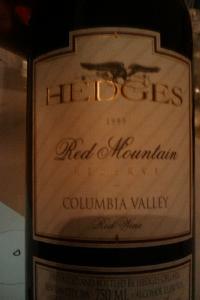 Last up is the Hedges 1999 cab which retailed for $85. The wine is quite mild on the nose. On the mid pallet are some fruit masked slightly by a tartness. This wine is quite long and dry and builds in the mouth. This was my least favorite cab but even this was not bad at all! 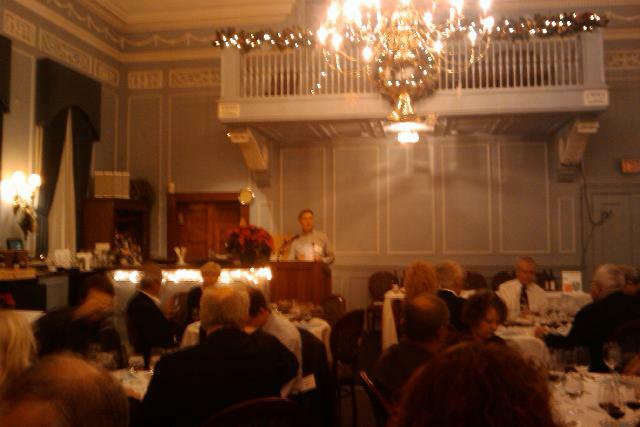 The event was held at the University of Toronto Faculty club!